This site is now the officially maintained site for the Softrock Lite II kit. The previous documentation on www.wb5rvz.com is no longer being maintained. If you are curious, you can still pop over to the previous site to see the original documentation, but be advised that it is no longer being maintained there. This set of builders notes is replaces and supercedes the notes for the original SR Lite II design, now documenting a combined kit with all of the components required to do any of the five available options (post 1 Jun1 2010). The original design's schematic dates back to December 2009. The current design's schematic is depicted in the Schematic Section, below. The Softrock Lite II, the sequel to the SR Lite V6.2 series , provides an economical entry-level kit for the ham or SWL who wants to experiment with Software Defined Radio (SDR). The Lite II circuit board size is 2.5 inches by 0.9 inches. All SMT components are mounted on the bottom of the board . Prices and availability of the kit are found at the Softrock Ordering Website. This kit was originally offered in several versions, corresponding to bands of interest. 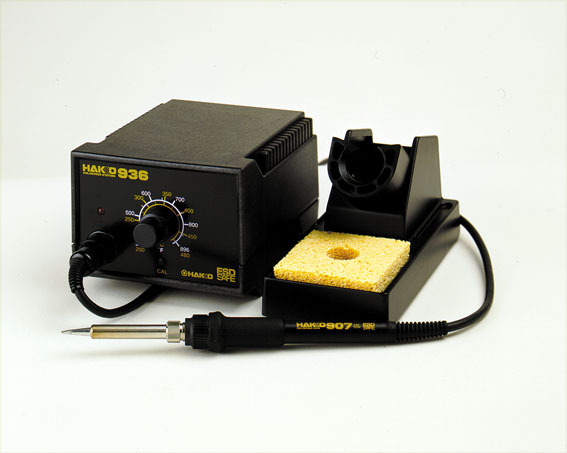 It has, since, changed over to the Combined Lite II. This "combined" kit will include all components needed to build the kit as a 160m, 80m, 40m, 30m, or 20m receiver. The 15m option is no longer offered. The builder can decide which kit to build at commencement of the build; the parts for any of the options are included in the shipment. The Combined Lite II kit will be priced at $20 plus $1 for US postage or $2 for DX postage. The 30m and 20m kits will all make use of 1/3 sub- harmonic sampling. Prices for these kits are found at the Softrock Ordering site. X1 now 14.089MHz for 80m. The original notes were compiled into a PDF file by Philippe F6CZV for those who are still working with the original, now superceded SR Lite (non-combined) kit. Please note that the design of that original kit and the currently offered (from KB9YIG) kit is quite different. Don't get them confused! 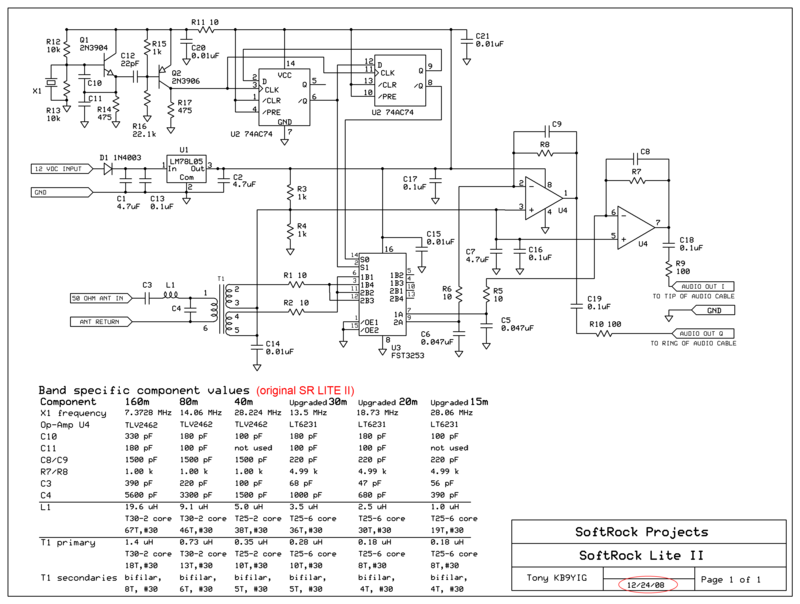 The schematic for this SR IF Lite II kit is essentially the same as the schematic of the SR Lite II combined kit documented herein and these build notes can be used for the IF version. Many thanks to Jan G0BBL and Tony KB9YIG for their input to this and the stages' theoretical discussions. This 20m receiver is patterned on the classic "direct conversion" receiver, in that it mixes incoming RF down to audio frequencies by, in effect, beating the RF against a Local oscillator such that the mixer products are in the sub 100 kHz range. Unlike the traditional DC receiver, the SDR does not "tune" the local oscillator's frequency to beat up against a desired RF signal. Instead, the local oscillator is at a fixed frequency of 18.73 MHz. The two quadrature signals from the Divider stage are fed into the mixer stage. The 4.6825 MHz quadrature signals from the divider in the 20m option are rich in harmonics. The third harmonic (14.0475) is what is actually used in the mixer stage. The mixer stage mixes the bandpass-filtered RF down to two baseband signals that are also in quadrature and otherwise identical to each other. The two baseband signals are provided to an amplifier stage where they are amplified and low-pass filtered to levels acceptable to the PC's soundcard stereo line-in inputs. A soundcard which can sample 48 kHz, can digitize an incoming "chunk" of baseband signals from 0 to 24 kHz. Such a soundcard, using its stereo line-in inputs for the I and Q signals, will yield an effective bandwidth of 48 kHz: 24 kHz above the center frequency and 24 kHz below the center frequency. The SDR software in the PC manipulates the digitized I and Q signals to deliver, demodulate, condition, and filter signals within this 48 kHz spectrum. Soundcards capable of higher sampling rates (e.g. 96 kHz or 192 kHz) will yield proportionately wider bandwidth, provided their internal audio filters do not cut off the higher audio frequencies. Mike Collins KF4BQ (whose photos of the completed board are found further on in this page) has performed extensive tests on this receiver and has found it to be an exceptionally powerful receiver. Considering the cost, nothing out there can beat it! Note: the completed pictures are of the 40m option, which the author built. Other band options (which the author did not build) will appear slightly different (especially the inductors, whose windings and cores will vary by band) for the band-specific components. Using approximately 16 inches of #30 wire, wind 26 turns on a 0.30 inch od T30-6 (yellow) ferrite. Inductance = 2.50 uH. Primary: Using approximately 7 inches of #30 wire, wind 8 turns on a 0.30 inch od T30-6 (yellow) ferrite. Secondary: Using a total of 7 inches of #30 wire, wind 4 turns , bifilar, on the ferrite in the same direction as the primary winding. Inductance of the single winding (usually the primary) is 0.18 uH.